Flash-forward several millennium, and Dragon crash-landed on Godworld, a planet created by the Elder Gods to serve as a home for the vast number of offspring born over the centuries by the various pantheon of Gods. Thor, exiled to Godworld as punishment for his rebellious nature, was now leading these young gods and rallying them for an invasion of Earth. Dragon and his allies fought valiantly to prevent this invasion from occurring, gaining assistance in the form of the mighty Herakles. Despite their efforts, Thor and his army proved too much for the heroes and as defeat seemed imminent, AllGod appeared. AllGod decreed that he would not allow the invasion of Earth to occur and sent home the mortals present (Dragon and allies) so as to prevent further interaction between mortals and Gods. A short time later, the Elder Gods had dispatched a small unit known as the God Squad to retrieve any lingering offspring of the Gods that were still living on Earth. Herakles led this team who were ultimately defeated by one of their targets, Zeek. AllGod opened a portal to Earth so that Thor’s army could pour through to reclaim their injured comrades. 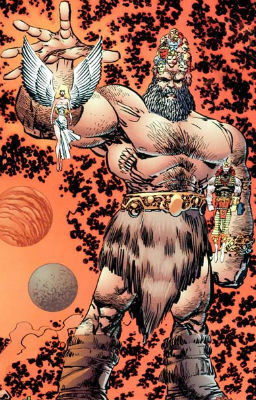 When Godworld was then destroyed as heroes from Earth retrieved their own abducted allies, AllGod left the former inhabitants of that planet to dwell on Earth, rather than open up the already overpopulated realms of the Gods to their offspring. The Gods took to living in a city of their own design, God Town, but when that was also destroyed involving mortals and an ancient creature called the Forever Serpant, AllGod decided to rescind the decree of non-interference. The Gods were now free to live out their lives amongst humanity, for good or ill. When the Tyrrus Combine launched a global assault upon Earth, the planet seemed to be doomed. The aliens tore through heroes, villains, Gods, innocent civilians, the military… Everyone! All looked to be hopeless until Rex Dexter managed to make contact with AllGod, taking inspiration from a suggestion from Malcolm and Angel Dragon. AllGod appeared suddenly in the air and unleashed almost all of his power to exterminate the vast majority of the millions of Tyrraneans running across the Earth. With his goal accomplished, AllGod collapsed down to the surface where he was then struck by numerous missiles launched by the air force. The weakened AllGod was killed instantly, dooming all of the numerous Elder Gods that comprised his form.